You will find in all good bookshops the latest issue of HEY! - Modern Art and Pop Culture, No. 21, which devotes a few pages to the works of Alfred Courmes! 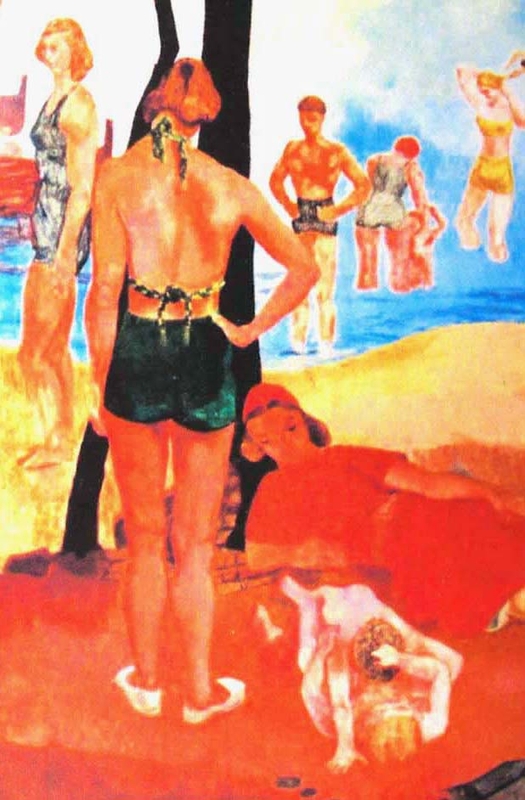 beach under the complacent gaze of their mothers and the provocative attitude of some of the great female characters of the composition, and would have required the work to be removed from public view. It is in this context and perhaps in anticipation of the arrival of President Vincent Auriol, that the Ambassador Hubert Guerin put "Happy France" out of the view. Two thirds of the large panel were, at first, covered by a "green Aubusson tapestry" and other parts of the canvas on frames were hidden by shelves bearing china and silverware. In 1956, a tapestry of Gromaire just sit on the large panel and the new ambassador, Charles Lacoste, hang works of his father. In 1957, major work to cover the mural fresco and to paint over it are undertaken: Henri Gleize, then ambassador, talks of "... the installation of insulating material on which it is possible to paint without compromising a large mural fresco that a tradition, supported by solid grounds, forbids to present to the guests of the embassy. "!! The dining room in 1956. 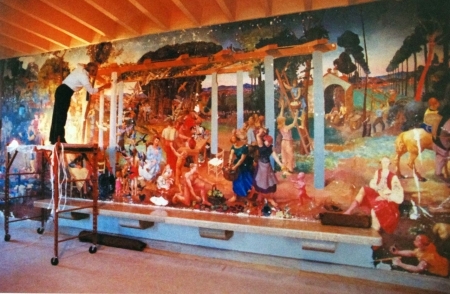 The mural is hidden by a fabric on which hangs the Gobelins tapestry, "Spring" by Gromaire. 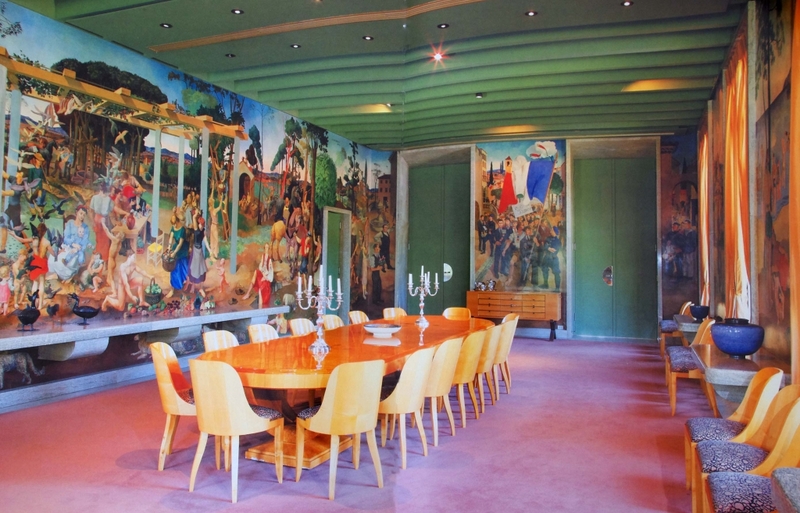 In the late seventies, the ambassadors Jacques Viot and Pierre Maillard had hoped that the paintings in the dining room could be rehabilitated. But it was not until the eighties with Jean and Jean-Pierre Cabouat that funds are released. 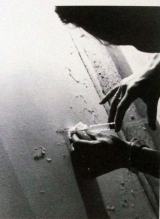 In 1982, art restorer, Paul Ledeur, sets a diagnosis: The work of Courmes was covered with six coats of paint hidden by a canvas painted in white, fixed on a frame !! Update surveys conducted by the restorers of Paul Ledeur’s team. - 1982, bring to light the totality of the fresco. 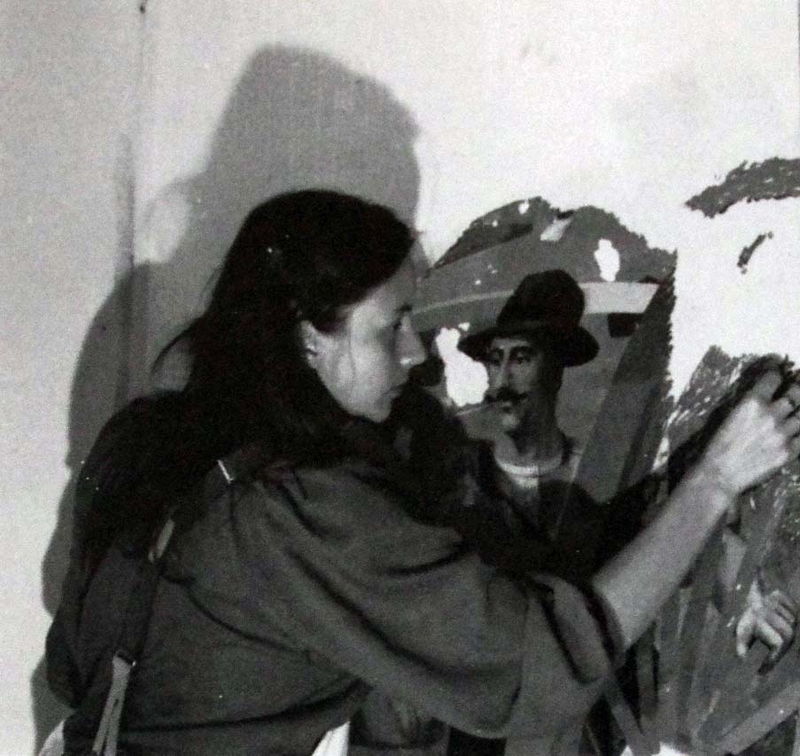 - 1984, restoration and protection of all of the work. A very special technique was developed to take off one by one the six layers of paint with water steam and fixer injection with medical syringes. This work lasted four months, at a rate of 50 cm per day per technician. Injecting a spray, humidification, taking off shreds of paint and finish with a scalpel. Then the pigment gaps due to wear and drapes support holes were restored in collaboration with Alfred Courmes, 86 years old, who could not make the trip to Ottawa. Jean- Paul Ledeur redraws the missing parts. On July 4th, 1984, I can finally celebrate the end of a disgrace: the updating of a major work of French cultural heritage. 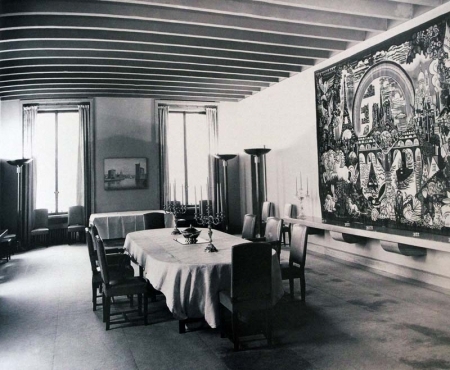 Alice Murray in the City and Contry Home wrote "The dining room of the embassy has now regained its original splendor. Dining there is a social event in Ottawa much sought after." 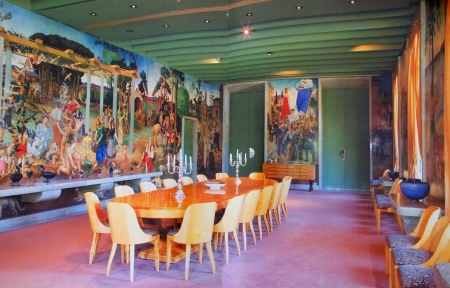 The large dining room of the Embassy of France in Ottawa restored. 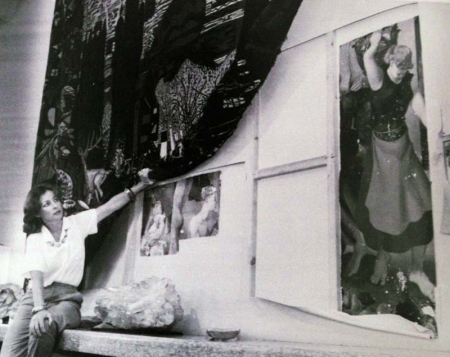 For similar reasons, and at the same time, the sculptures of Louis Leygue decorating the living room, had been dismantled. 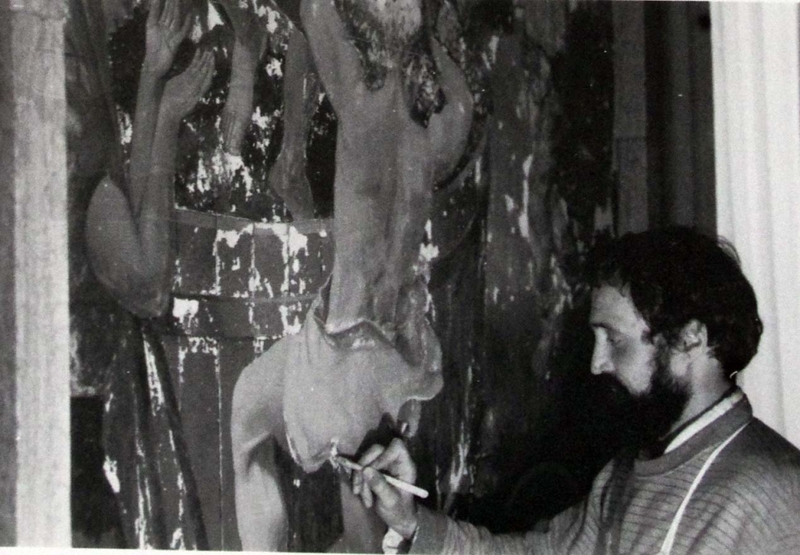 Fortunately found in the basement of the embassy, they could be restored and tightened again by the team of Paul Ledeur. 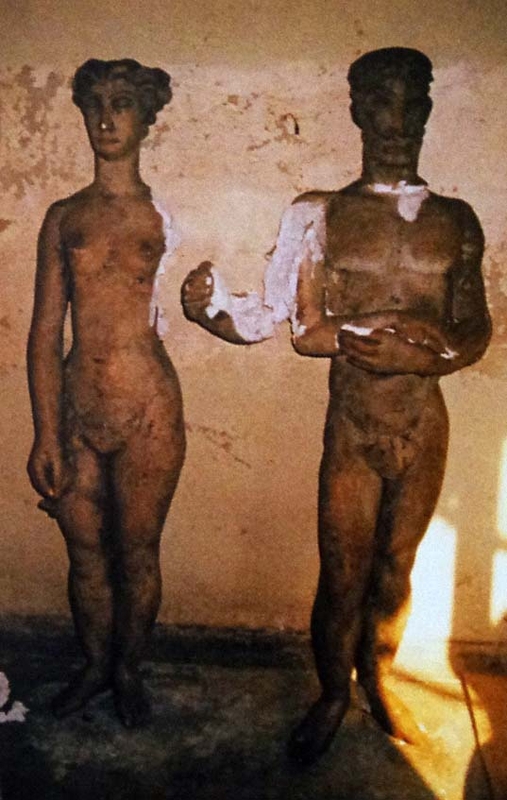 Adam and Eve when they were discovered in the basement of the embassy. Texts and photographs from or inspired by the works of John Fouace, "Ottawa, Embassy of France," 2010, International Publishing heritage and Jean Paul Ledeur, "The 30s on the Outaouais banks," 1993.